Dining at Alba Osteria on Valentine’s Day goes against my better judgement. I cancelled a reservation here during Restaurant Week, fearing crowds and a new kitchen wouldn’t serve up the best representation of the food. So, why am I making my first visit at another time notorious for overwhelming a restaurant kitchen? I’m either a glutton for punishment, or just a glutton. Actually, I’m hopeful that Alba Osteria is up to the challenge. Early reviews have been good, including one from The Washington Post’s Tom Sietsema. Valentine’s Day marks my second time in a week dining at a new DC-based osteria. Last week it was Osteria Morini. This week Alba Osteria. Chef Roberto Donna of Al Dente, and Amy Brandwein formerly of Casa Nonna, bring us cuisine from the Piemonte region of Italy. The accent is heavier at Alba Osteria compared to Osteria Morini, and not just because Donna hails from Italy. Some of the dishes have Italian names that we can’t easily identify, so we find ourselves turning to Google translator for assistance. Cavolfiore alla Cavour comes from the piatti caldi (hot dish) section of the menu. Need a translation? 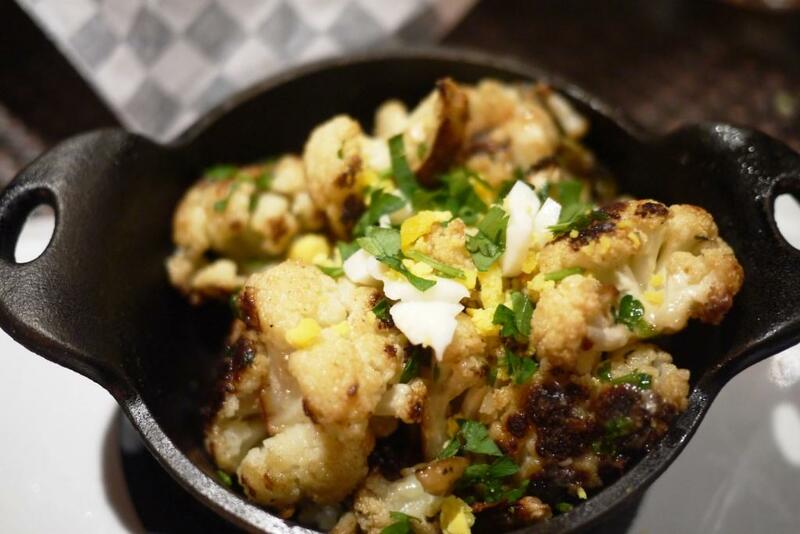 It’s cauliﬂower with parmigano reggiano, anchovy, and egg. My husband says it is molto buona (very good). The egg and anchovy add character and distinction. The zesty lasagnette piemontese with robiola cheese, leek, and béchamel sauce speaks to him in any language. No translation needed. 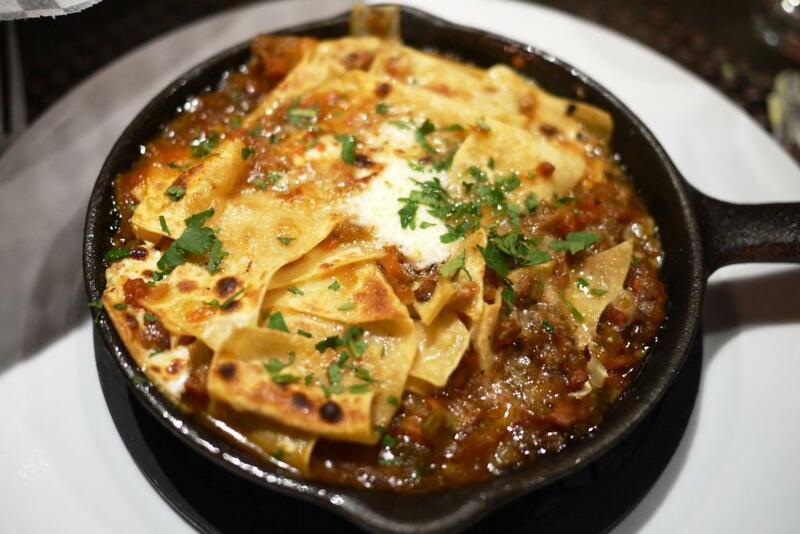 He has a full order, but all pastas on the menu are available in a smaller size. The four-course $54 Valentine’s Day special attracts my attention, and it’s all in plain English. My meal commences with roasted tomato soup dotted with pieces of firm shrimp and topped with parmiagiano reggiano cream. The soup arrives piping hot. I gasp, initially at the heat, but also in response to the delightful depth of flavor. My second course is an “awwww” moment. 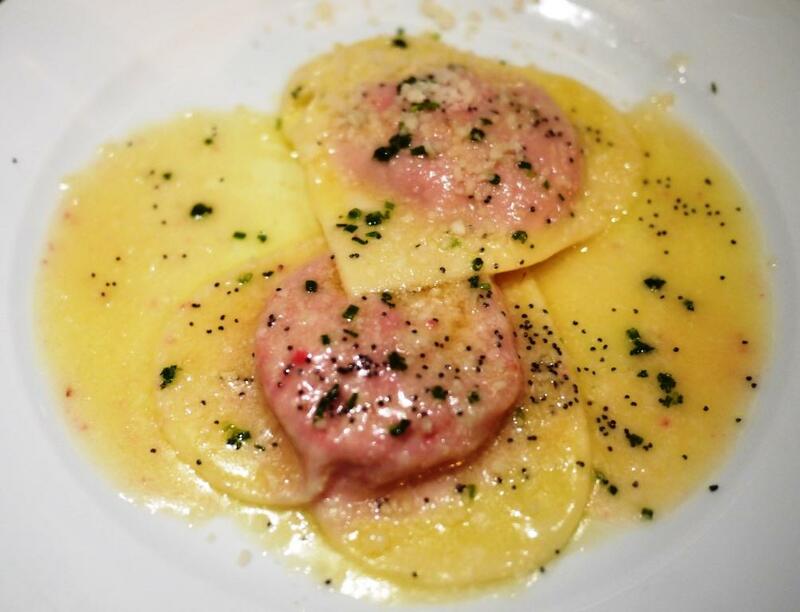 What ‘s cuter than heart-shaped beet raviolo with butter and poppy seed sauce? After a hefty portion of soup, I tread lightly on the pasta, offering half to my husband. It is Valentine’s Day after all. 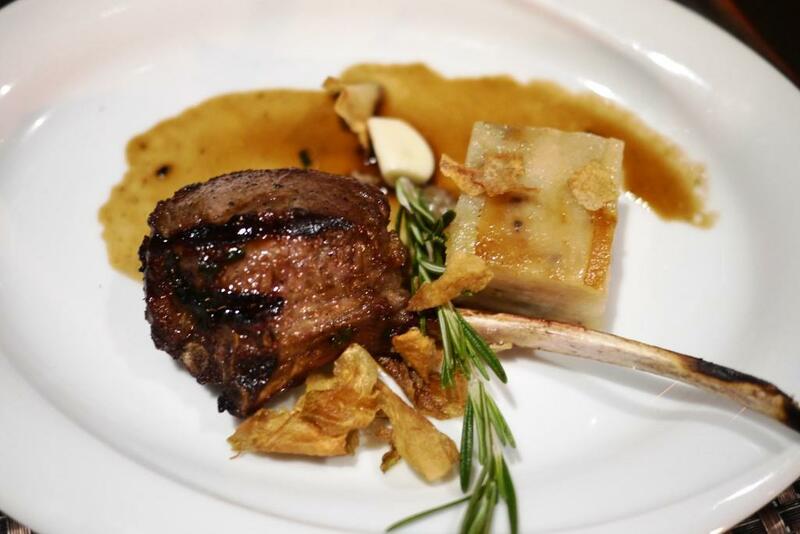 My main course is described as lamb rack with rosemary sauce, accompanied by potato tart, and fried artichoke. While the first two courses are generously portioned, the “rack” of lamb is a single small chop. It is well-seasoned, and I savor every bite, although what I wouldn’t give for just one more taste…. The potato tart suffers from a lack of seasoning, but overall it’s a satisfying dish. I’m happier when I think about it within the context of the preceding courses. Our service is competent, although we are amused by a situation unfolding nearby. A food runner is repeatedly attempting to deliver a salad to the couple at the table next to us, only to be told each time that the salad isn’t theirs. This scenario repeats itself three times, until he finally gives up. The same couple is subsequently delivered another duplicate dish, which they initially try to decline. Ultimately they spare the confused staff and accept the gift. Their clumsy service has an upside for us, as we end up having a laugh and a lovely conversation about DC dining. My dessert is a plus-sized portion of polenta bianca ( snow white polenta) with crunchy caramel and chocolate gelato. 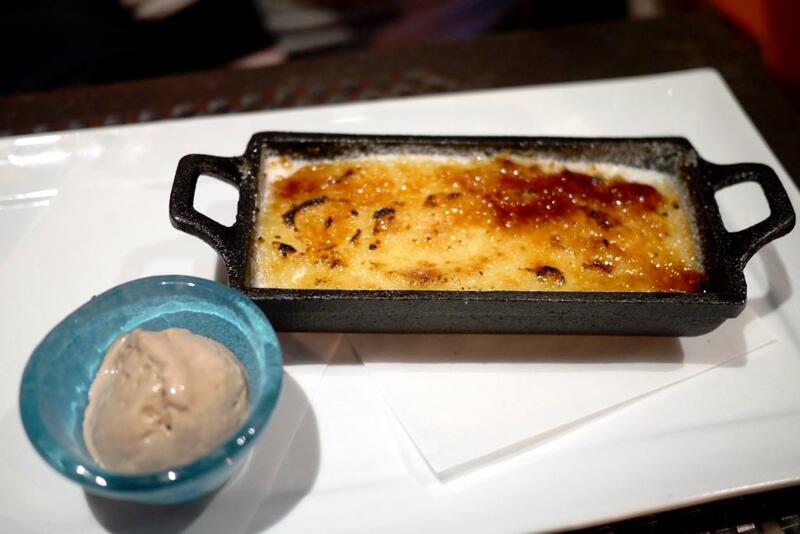 I admire the not too sweet polenta underneath the sugary brulee topping, and the gelato is fantistico. One of our new dining companions likes the dessert, while the other isn’t quite so enamored. His quotable comment: “Its a dessert that’s functional, but not crave-able.” I want to claim this phrase as my own. Love it. Despite witnessing a few service snafus, I’m impressed with Alba Osteria’s ability to keep up with the crowd. Overall, I find the special menu to be a hit, but wisely the restaurant has kept its full menu available as well. Options are appreciated. Alba Osteria demonstrates a love for Italy in its cooking. And for me, especially on Valentine’s Day, that’s amore.